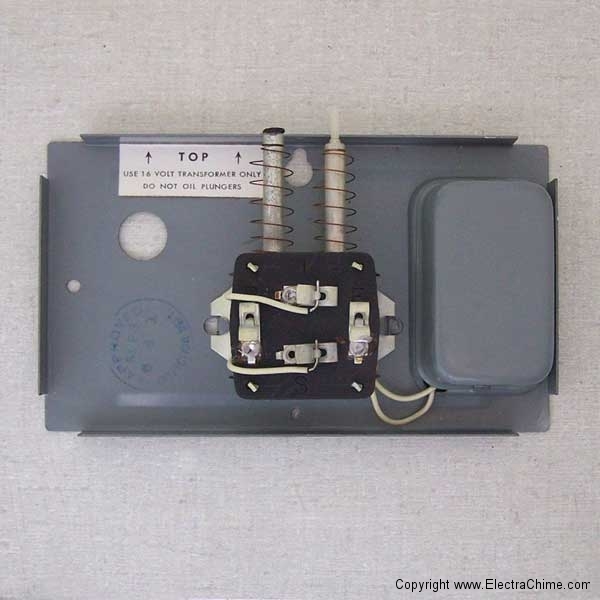 This unique vintage doorbell chime combined an on-board buzzer that would alert residents of visitors and warn of a potential hazard in the home. 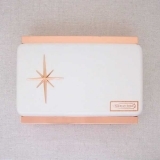 All in iconic Mid Century Modern Style. 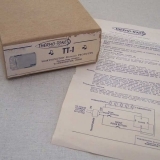 The Thermo-Tone doorbell function was fairly conventional, ringing two notes for the front door and a single note for the rear door. 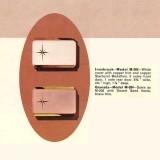 The tone-bars were mounted to the case, much like the Rittenhouse Twintone. 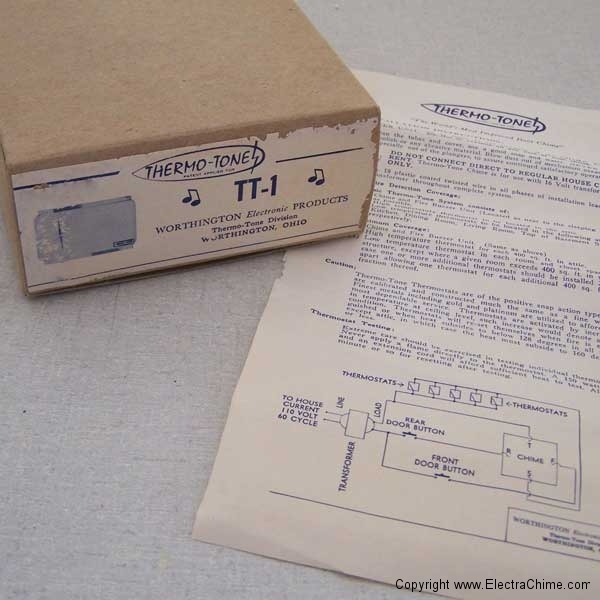 Unlike the Twintone, the Thermo-Tone also featured resonators appurtenant to the cover. The resonators were handsomely plated to match the copper star-burst medalion affixed off center on the cover. 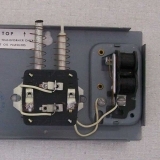 Unique to the Thermo-Tone was the addition of an on-board buzzer connected to wiring independent of the door chime as a fire or freeze warning. 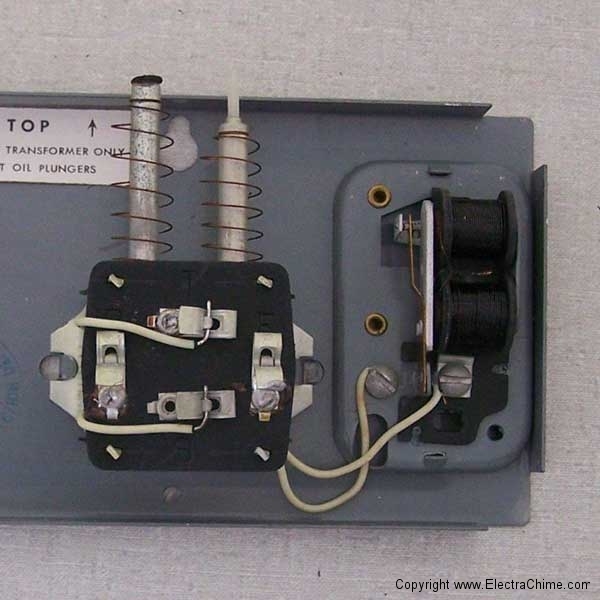 The buzzer would sound if any one of several thermostat switches wired in parallel were tripped if temperatures in parts of the home were dangerously hot, or cold. The thermostat switches were sold separately. Although innovative, the Thermo-Tone doorbell safety alert system t never really caught on, perhaps for one or both of the following limitations. 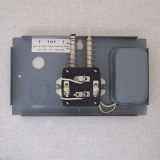 As a doorbell, the Thermo-Tone’s utility was compromised for safety as the instructions urged that it be installed as close to the sleeping area as possible. Most door chimes are located on the ground floor or front of the home so they can be heard. In larger homes, a doorbell mounted near the bedrooms may have been too distant to be heard in the living areas of a home since most people ring the doorbell in the daytime. 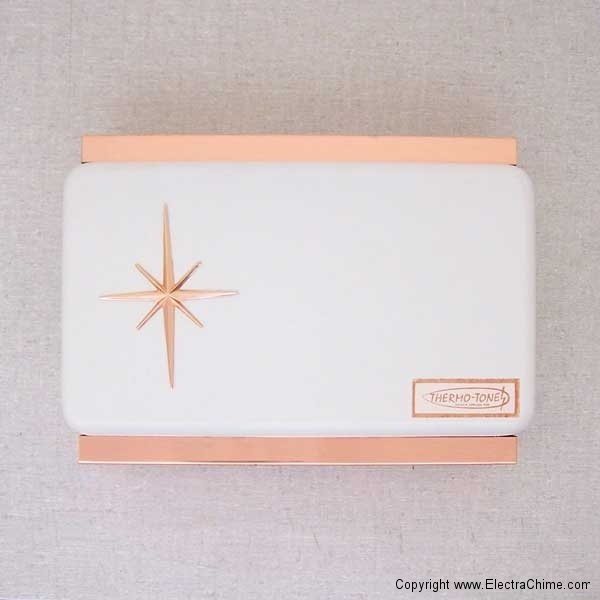 In addition, the safety buzzer needed to be wired to a number of thermostat switches; one for each room, closet, and one for each 400 square feet of attic. This would require a great deal of extra wiring, which would be laborious and somewhat costly in the construction of a new house, and prohibitively difficult and expensive in an existing home. 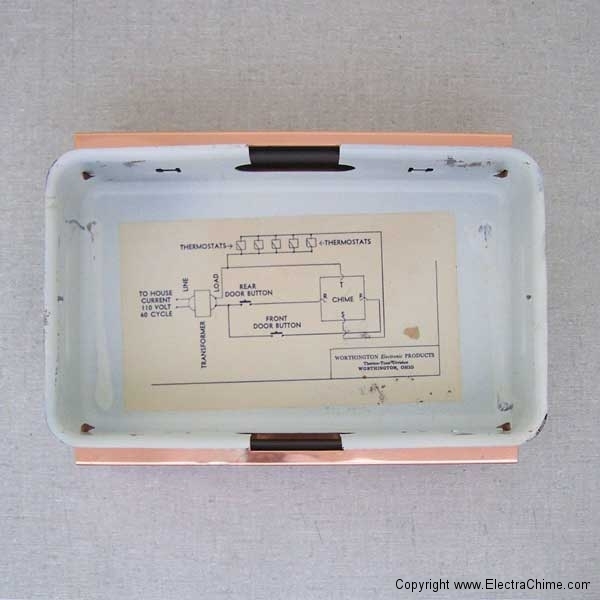 As a precursor to modern battery-powered smoke alarms, the Thermo-Tone was indeed ahead of it’s time. Anybody know of an installed Thermo-Tone?? Contact the Museum. 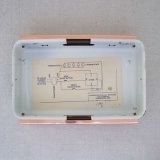 Manufacturer Worthington Electronics Products, Thermo-Tone Division. Likely manufactured by Miami Carey.